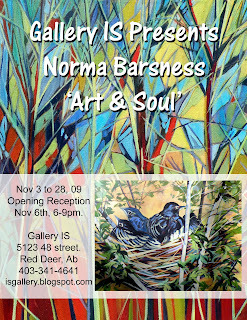 Norma Barsness is having a solo show with Gallery Is for the month of November 2009. The show titled "Art and Soul" is full of Norma's familiar bold rich colours and local landscapes that are sure to warm your soul. Please join us in celebrating with Norma for the First Friday event- November 6- 6pm to 9pm when the artist will be in attendance. The Gallery Hours are 11:30 to 9pm on Friday. This is a HUGE SALE everyone. From October 19th to the 30th only. "My studio is about to go through some renovations, so instead of trying to pack these pieces away, I would rather you take them home and enjoy them. So, I am offering them at seriously reduced prices. Some of them are 40, 50, 60 and 75 percent off! If these selected works have not sold by the 30th, I will be painting over them and recycling them into new artworks. They will not exist anymore. SAVE THEM!" She will accept Paypal, which means you can pay however your heart desires. She will ship to you if you live outside Red Deer. If you are in Red Deer you can come into the Gallery and pick up your piece. We can accept Visa, Mastercard, AMEX, or Debit or Check. Contact Erika to reserve your new artwork. Remember to tell all your friends too. Great for a Halloween display for just for fun. 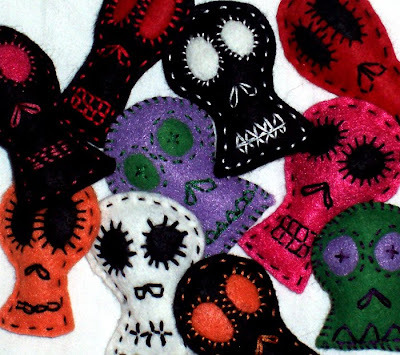 Each decoration is 2 inches and made from felt by Erika Schulz. Each one is unique, and they are only available untill the end of the month. In case you are a fan, we want to pass on some important info. Rikki Renard has started up her first website. You can see a large collection of her work, both past and new. Lauren Cowles has created a blog featureing the Gallery and the Collective of artists working in it. She has also updated her website, so be sure to check that out too. Have you been paying attention to the blog of Erika Schulz and the website of Jeri-Lynn Ing? Well, if you want to keep up with their artwork-a-day project, they are the places to visit for the most current additions to the challenge.